Henry Frederic Reddall : Hawaiian Sports, 1885. From the Golden Gate to the Golden Horn. New York, Phillips & Hunt; 1885. 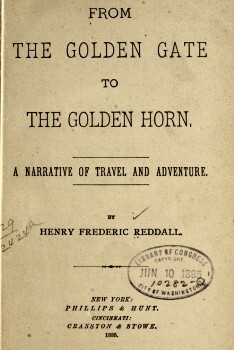 Includes an account and illustration of surfboard riding, and accounts of sled riding and cliff jumping on the big island of Hawaii. The journey to the coast began on the following morning, much as the entire party would have liked to prolong their stay on this wonderful island. But only four days remained in which to catch the steamer from Honolulu. 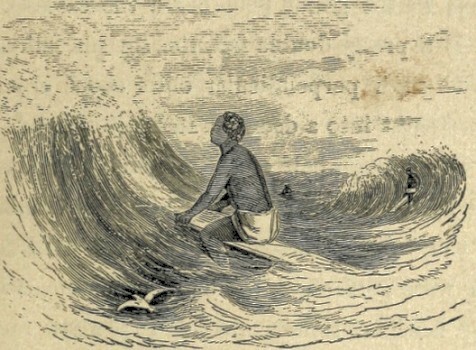 At the village of Kauwaloa, on Kealakeakua Bay, they were fortunate enough to witness an exhibition of the dexterity of the natives at one of their ancient sports - that of the surf-board. In the Hawaiian Islands, and nowhere else, is this thrilling pastime to be seen to full advantage. 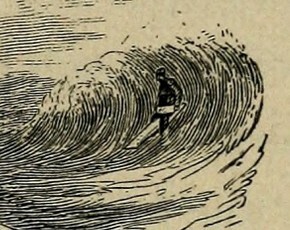 The surf-board is a stout plank, about two feet wide and varying from eight to twenty feet in length. Only the most agile and powerful of the natives can engage in this play, and it requires great courage and strength. Plunging into the surf each man, armed with his board, makes his way through the breakers to the comparatively quiet water beyond, more than a mile from shore. Here he waits for his opportunity = a larger wave than ordinary, bound shoreward. When he sees it coming he kneels on his board with his back to the coming billow. Onward sweeps the great comber, which catches the surf -board, and propels it at the speed of an express train toward the beach. The velocity often equals a mile a minute, and by a clever leap the man clears the foam and leaps unharmed on the strand. Sometimes the giant billow tumbles the man and his board over and over like a piece of drift-wood; but, nothing daunted, the bold swimmer makes his way seaward again and waits for another comber. Another famous native sport is called parua. top of a long hill, and then the plank flies down the steep sun-dried grassy slopes at a terrific pace. Sometimes the board will jump small depressions twenty feet across without dislodging the rider. A visit to Rainbow Falls was gotten up for our travelers' entertainment, there to witness the native gambols in the glassy pool below the cascade. The latter is a pretty double fall, the stream falling over two well-nigh perpendicular cliffs about a hundred feet in height into a deep "water-hole" beneath. projecting rocks fully twenty-five feet in height. But all these feats were only to lead up to the grand event. On one side of the pool was a precipice fully one hundred feet high. Two natives were to jump from this, clearing in their fall a projecting spur jutting out some twenty feet from the face of the cliff. The men, stripped to the waist, appeared for a moment at the brink, then disappeared for a run to gather momentum. over, and fell like a plummet into the water. He emerged almost immediately, and walked up the bank as though nothing had happened out of the ordinary. Phillips & Hunt; New York,1885. Geoff Cater (2017) : Henry Frederic Reddall : Hawaiian Sports, 1885.